In 2011, UN Security Council Resolution 1973 under Chapter VII led to the destruction of Libya, now a terrorist infested failed state. 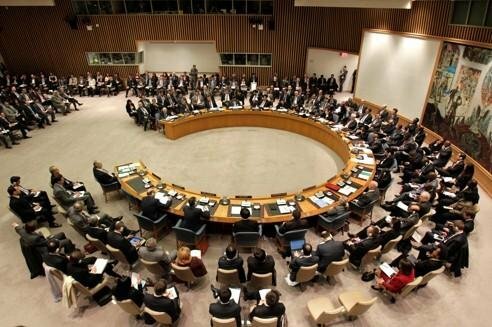 Will another Security Council Resolution under Chapter VII lead to the destruction of Russia? When the following five words are heard at the UN Security Council: “Resolution Adopted Under Chapter VII,” be afraid, be very afraid! For the second time in 21 days, Russia vetoed a US-NATO sponsored draft resolution, the most recent one invoking Chapter VII. Russia’s veto helped avert the risk of a major war. The agenda of the Malaysia draft resolution S/2015/562 was transparent, and any suggestion of impartiality was ludicrous. The war drums were beating, and without trial, without the presumption of innocence, and without any impartial investigation into the actual perpetrators of the internecine warfare which is now destroying Ukraine, Russia is condemned as the guilty party, though the facts reveal that Russia is the victim of intrigues so Byzantine that even Russia may not be able to withstand them. Although the responsibility for the downing of Malaysia Airline Flight MH17 on July 17, 2014 has never been established, nor, indeed, has it been established if the downing of the flight was an accident, a mistake, or an act of premeditated murder, the Malaysia draft resolution vetoed by Russia, with abstentions by China, Angola and Venezuela, has prejudged, tried, convicted, condemned and sentenced to imprisonment or death parties which are the victims of one of history’s most venal acts of geopolitical engineering, the destabilization and overthrow of Ukraine’s democratically elected President Yanukovich, an action masterminded by US Assistant Secretary of State Nuland, on behalf of the US-NATO neo-conservative agenda. “The cruelty of the Kiev authorities’ attacks have simply spiraled. Donetsk, Luhansk, Horlivka and many other residential areas have suffered massive bombardments, including indiscriminate firing of Grad rockets and aerial bombing. Strikes are hitting civilian targets, including transport and public routes, hospitals and residential areas. In Horlivka alone, dozens of civilians have died. And in most cases there are no militias to be found anywhere near. Does the information that we have been seeing on the use of Ukrainian military ballistic missiles not speak to rampant military escalation? All of this fully supports our description of the Kiev authorities’ actions as a punitive operation against its own people. A stream of refugees continue to arrive on Russian territory, with more than 150,000 so far seeking temporary asylum, residence permits or citizenship. Unfortunately, a year after the adoption of resolution 2166, serious issues remain as to how the investigation has been conducted. Russian experts were not provided equal access to the various aspects of the technical investigation. They unilaterally provide their data and calculations, but remain unaware of what then happens to the information. We have repeatedly offered to provide qualified experts and equipment to carry out complicated work, for example, metallurgical analysis, which would have enabled us, by testing pieces of the wreckage, to determine the type of missile that brought down the plane. All that remains unanswered. Turning to criminal investigations, they are being carried out by members of the joint investigation team in a closed fashion. It was reported that an agreement had been reached by the five countries not to disclose information. Given this case, what grounds are there to be assured of the impartiality of this investigation? Can the investigation stand up to the backdrop of aggressive propaganda from the media? Can it withstand the pressure of an obvious political put-up job when the causes of the disaster and those responsible are announced in advance? Moreover such statements are being made by a number of the leaders of States that make up the joint investigation team. The Russian Federation was the only country to point out that resolution 2166 provides for comprehensive United Nations assistance for the investigation. We offered to consider the creation of the post of a Special Representative of the Secretary General, which would have helped to ensure a truly international and transparent investigation. However, our proposal was not accepted… What did we get instead? We got something that was summarily prepared outside the Security Council, without thoughtful consideration of the available options for a criminal investigation: a draft resolution under Chapter VII of the Charter of the United Nations. Our position that this was a premature, ill-defined and legally untenable step was not heeded. We have repeatedly stated that we do not support the idea of setting up a tribunal under Chapter VII of the Charter. There are no grounds for it, given that in Resolution 2166 the Security Council did not classify the Boeing tragedy as a threat to international peace and security. It is difficult to explain how this event, which a year ago was not considered to be a threat to international peace and security, now suddenly becomes one. 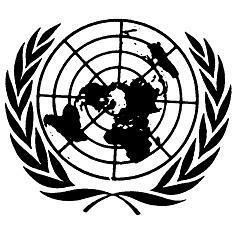 In principle, issues pertaining to organizing a criminal investigation do not fall under the remit of the Security Council…..No precedent in principle exists for the establishment by the Council of international tribunals to bring to justice those responsible for transportation disasters. This is something that has also happened in Russia, of course. In 2001, a Siberia Airlines flight was shot down over the Black Sea by Ukrainian anti-aircraft missiles. There was also the incident involving the Iran Air flight shot down over the Strait of Hormuz in 1988 by a missile fired from an American destroyer. National investigations were carried out at the time in Ukraine and in the United States, but no determination was made that a crime had been carried out. However, resolution 616 (1988) adopted following the deadly downing of the Iranian airliner, did not qualify the incident as a threat to international peace and security….We must therefore note that the draft resolution (S/2015/562) that was put to the vote today lacked any legal basis or precedent…the authors of the draft resolution have refused to act in a spirit of cooperation and put it to a vote, knowing that it would not lead to a positive outcome. In our view, this points to the fact that political aims were more important to them than practical objectives. This is regrettable. In no circumstances would we like to see this deplorable incident and the suffering of the victims be politically used as part of the conflict affecting this region of Ukraine. Our country condemns this attack against civil aviation. Such acts are inadmissible and must not go unpunished. On this occasion, we would like to recall the highjacking of the Cubana de Aviacion flight in 1966, which resulted in deaths of 73 innocent civilians. The perpetrators of that heinous act still enjoy impunity…..Let us not prejudge or reach conclusions that are unfounded. We must avoid the politicization of this affair within the Security Council and continue with the investigations, which we hope will produce results enabling us to determine the causes of this deplorable incident and the responsibility for it. The following statements by Mr. Albert Koenders, Foreign Minister of the Netherlands, and Ms. Julie Bishop, Foreign Minister of Australia were noteworthy for their venomous and enraged attack demonizing Russia, and their hysteria is suggestive of a preconceived agenda, a kangaroo court fabricating a bogus case against the East Ukranians, contriving biased, politicized accusations and convictions, with the intent of using the proposed resolution under Chapter VII to authorize and attempt to justify a US-NATO attack on East Ukraine. Their verbal violence suggests the possibility that the Russian veto had frustrated an aggressive and deadly agenda that reached far beyond concern for bereaved families, or concern for accountability. In a world with an increasing number of violent terrorist groups and other non-State actors, many with sophisticated military capabilities, it is inconceivable that the Security Council would now walk away from holding to account those who brought down a commercial aeroplane. The veto only compounds the atrocity. Only one hand was raised in opposition, but a veto should never be allowed to deny justice. The recital of discredited contentions and the anticipated excuses and obfuscations of the Russian Federation should be treated with the utmost disdain. The exercise of the veto today is an affront to the memory of the 298 victims of Flight MH17 and their families and friends. Russia has made a mockery of its own commitment to accountability enshrined in resolution 2166. If Russia has evidence relevant to this matter, surely Russia would want it heard by a wholly independent and impartial tribunal set up by the Security Council, of which it is a member, and with a registrar, prosecutor and judges appointed by the impartial Secretary General. The tribunal would have operated in accordance with the highest international standards under the auspices of the Security Council, of which Russia is a member…..It has been alleged that our request for the Council to act is premature, but the establishment of a prosecution mechanism before the completion of a criminal investigation is wholly in keeping with the Council’s own practice….In unanimously adopting resolution 2166 last year, the Council demanded that those responsible be held to account and that all States cooperate fully with efforts to establish accountability. Resolution 2166 sent a definitive message that there would be no impunity for those responsible. Today one member has prevented the Council from fulfilling its commitment to the friends and families of the victims of Flight MH-17 and to the international community. Those responsible may believe that they can now hide behind the Russian Federation veto. 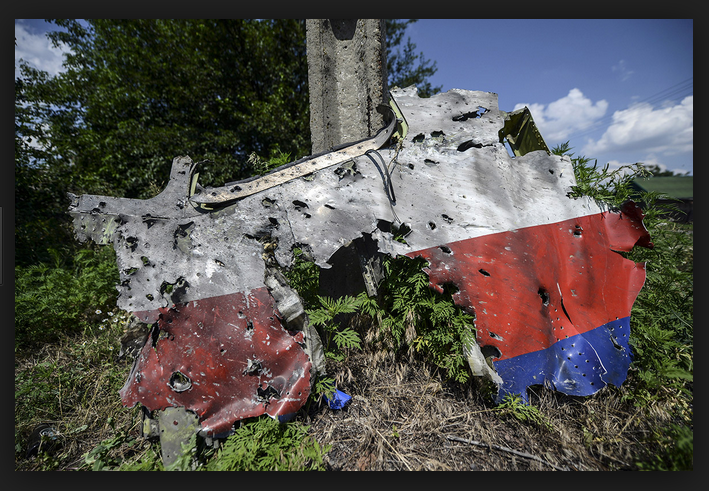 They will not be allowed to evade justice…..Twelve months ago, the tragedy of MH-17 shocked the world. Russia has used today’s vote to seek to politicize our quest for justice and should rightly be condemned. In defiance of today’s veto, we will ensure that the demand in resolution 2166 for accountability and the cooperation of all States is implemented in full. The Ukranian Foreign Minister’s statement is not merely irresponsible, partisan and unfounded; it is reckless and dangerous, and an incitement to escalation of the fratricidal war in Ukraine. He states: “If you know the truth, the truth will set you free,” attributing this homily to the Gospels. This motto is also the motto of the CIA. Two crucial questions demand an answer: what is the identity of the person or persons or authority responsible for directing the civilian airline to fly over Ukranian territory at war, and what was their motive? Was it mere negligence and incompetence, or something more sinister? The possibility cannot be excluded that the Kiev authorities deliberately martyred the 298 human beings aboard Malaysian flight MH-17, with the malicious intent to further demonize the East Ukranians, and implicate Russia in the tragedy, thereby concocting the “justification” to crush East Ukraine beneath the weight of a Chapter VII UN Security Council resolution authorizing “all necessary means” for NATO to destroy the East Ukranians’ anti-nazi struggle for dignity. This would make it impossible for Russia to avoid direct military involvement, and would constitute a provocation detonating a major war. Alternatively, or in tandem, a review of the “Statute of the International Criminal Tribunal for Malaysia Airlines Flight MH-17,” reveals a grotesque travesty of any legitimate search for justice, and makes obvious the trap set for Russia, and, indeed for President Putin, himself. The entire Statute is a blatant and infamous connivance to falsely accuse Russia, facilitating what in US law is described as “malicious prosecution,” a deliberately false accusation and a fabricated prosecution. It is brazen, to the point of notoriety, in view of the fact that the pro-nazi Kiev authorities have already, without due process, condemned Russia for instigating the current internecine war. At no point is the role of the US in initiating and instigating the current Ukranian crisis ever mentioned – nor is prosecution of those agents of the US government who instigated the destabilization of Ukraine and the coup d’etat which overthrew democratically elected President Yanukovich ever mentioned, although no one could possibly have forgotten the US Assistant Secretary of State’s immortal comment: “F**ck the EU.” Article 7 of the Statute is obviously intended to include only the prosecution of Russian President Putin, who is accused of supporting the anti-nazi East Ukranian rebels. Article 7 of the Statute states: “irrelevance of official capacity. 1. This statute shall apply equally to all persons without any distinction based on official capacity. In particular, official capacity as a Head of State or Government, a member of a government or parliament, an elected representative or a government official shall in no case exempt a person from criminal responsibility under this Statute, nor shall it, in and of itself constitute a ground for reduction of sentence. Paet visited Kiev on February 25, 2014 after the crisis of clashes between the pro-EU protesters and security forces in the Ukranian capital…….. Paet spoke with a doctor who treated the sniper victims. She said that both protesters and police were shot at by the same people…All the evidence shows that the people who were killed by snipers from both sides, among policemen and then people from the streets, that they were the same snipers killing people from both sides, and it’s really disturbing that now the new coalition, that they don’t want to investigate what exactly happened.” The doctor who treated the sniper victims turned down the position of Vice Prime Minister of Ukraine for Humanitarian Affairs offered by the coup-appointed regime. And who could forget Ms. Julia Tymoshenko stating: “Ukranians must take up arms against Russians so that not even scorched earth will be left where Russia stands – it’s time to grab guns and kill damn Russians” She also called for the “nuclear slaughter of the eight million Russians who remain on Ukrainian territory.” “I hope I will be able to get all my connections involved. And I will use all of my means to make the entire world raise up, so that there wouldn’t be even a scorched field left in Russia” she declared. With the exception of China, Venezuela and Angola, it is clear that the propagandizing of the UN Security Council has proceeded seamlessly. The Russian veto of the Malaysian draft resolution S/2015/562 prevented a lethal and deliberate miscarriage of justice, and a probable escalation of the crisis in Ukraine, and the vote on this scandalous resolution was forced to embarrass Russia and create the illusion of Russian recalcitrance. But be afraid, be very afraid. There will be more conniving and barely disguised draft resolutions under Chapter VII to come in the UN Security Council. The target is Russia, and the pathological goal is regime change or world war.